"Angel Projects,"3 traditionally held in conjunction with the American Institute for Conservation (AIC) annual meetings, provide local collections in need of conservation assistance with exposure to conservators interested in contributing their expertise. This version of an "Angel Project,"4 a modified version organized to coincide with the Society of American Archivist's (SAA) annual meeting, served as a pilot to work out and demonstrate a proposed procedure for the processing, rehousing, and reformatting of an important collection of historic scientific illustrations (Fig. 1). To cope with the enormous number of materials in their holdings, some archivists and collection managers, in the past, occasionally invoked a well meaning rule for ranking collections in need of care: original materials that had been published (i.e. had been made accessible through reproduction) might be ranked lower, with respect to preservation priority, then those that have not. There appears to have been times when this guideline was advocated for the sake of storage or short term cost benefit, with the unfortunate consequence that published materials were allowed to be discarded. The view that objects that have been reproduced are potentially expendable is not new, as there is even an interesting medieval precedence. Although it is fortunate that the stories detailed on those vellum folios were preserved for future use, it is highly unfortunate that all of the information inherent to the bound vellum volumes can no longer be accessed by modern day scholars of Icelandic history. As the seventeenth-century Icelanders viewed access as a viable means of preserving the information that was important to their cultural heritage, over two hundred years later some collection caretakers have, at times, embraced a similar line of reasoning. One case in point involves the preservation of scientific illustration collections, which, due to the very nature of their production (for the purpose of publication) makes them an ideal example of the rule: what is published soon may perish. ACCESS: The Freedom or Ability to Readily Provide and/or Receive Information. Fig. 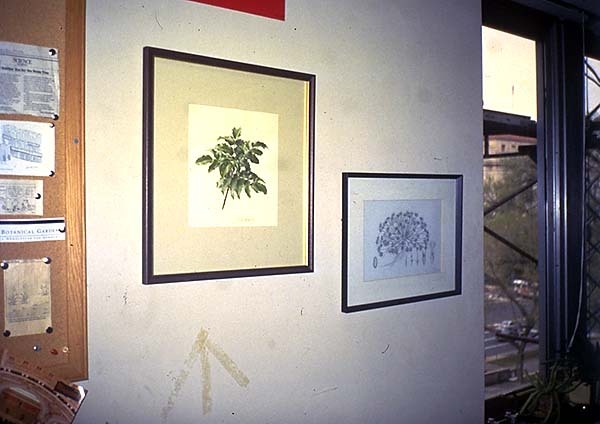 2: Original type specimen illustrations are often used to decorate walls, leading to loss of research value as they fade and yellow from light exposure. Fig. 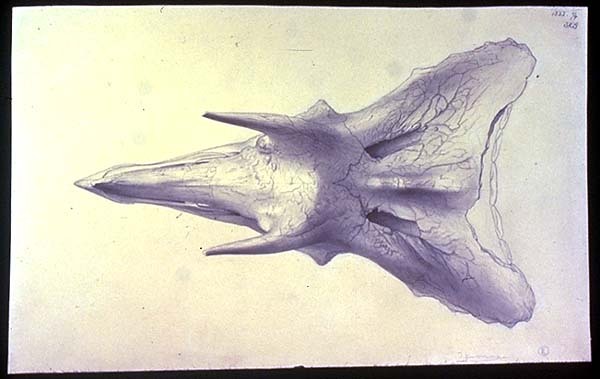 1a: Top view of a Triceratops skull (Yale University specimen). 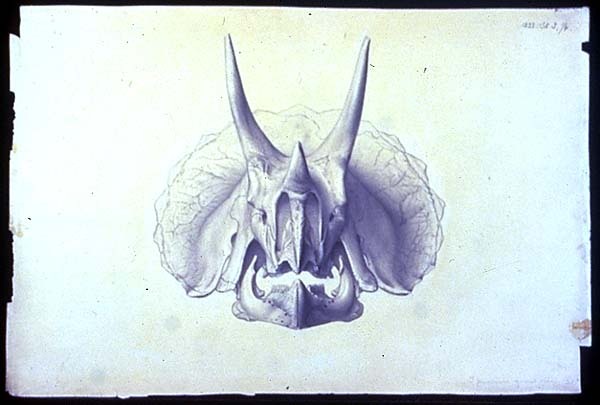 Published as lithographs in The Ceratopsia , 1907. Fig. 1b: Side view of a Triceratops skull (Yale University specimen). Published as lithographs in The Ceratopsia , 1907. Fig. 1c: Front view of a Triceratops skull (Yale University specimen). Published as lithographs in The Ceratopsia , 1907. Paleontologist Othniel Charles Marsh, under the auspices of the U.S. Geological Survey and Yale University, was responsible for discovering and naming many of the dinosaurs that are household names today, such as Triceratops and Brontosaurus (now known as Apadasurus). The immense collection he amassed in the late nineteenth-century now forms the core of the dinosaur collection in the Division of Vertebrate Paleobiology at the National Museum of Natural History (NMNH), SI. In the 1980's, the original drawings of the specimens, prepared under the direction of Marsh for use in a series of important monographs (Fig. 3) that were to provide the first details as to the orders and families of vertebrates while "illustrating them in the most artistic manner,"11 were unearthed by a museum specialist who was investigating water damaged objects stored on the tops of cabinets in the department's type specimen room. Fig. 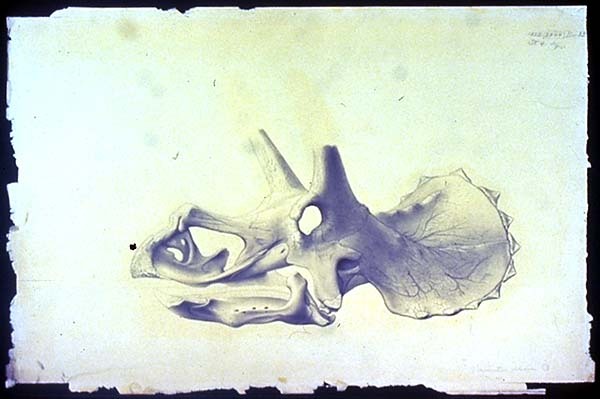 3: Original drawing of a Tricertops sacrum with the corresponding lithographic print found in The Ceratopsia , 1907. The Smithsonian's collection holds approximately 1,700 of these drawings, preparatory sketches and tracings found organized in folders that identify the specimen and the view that is depicted in the drawing, as well as identifying the drawings as having been either a wood-cut12 or a lithograph (Fig. 4). Fig. 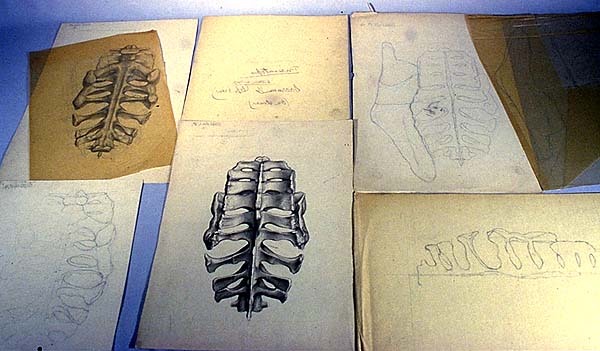 4: The contents of the folder labeled "Triceratops sacrum 1/4 (top view):" the final drawing, 6 preparatory sketches, and the final tracing that was used to transfer the image to the lithographic stone. When the Marsh illustration collection was located, its continuing historic and scientific value was assessed by some members of the department as being extremely high, despite the fact that it had been published. The drawings were offered to an archives that, due to their policies, were unable to accept them. Indeed, they reiterated the early principal of attributing a low preservation value to published materials. In July of 1995, approximately ten years after the rediscovery of the illustrations, the Conservation Analytical Laboratory's (CAL) Paper Conservation Lab, SI, was notified about the collection, its current housing (the drawings had been moved from the cabinet tops into wooden storage drawers in the department's type specimen room), and its relative condition. 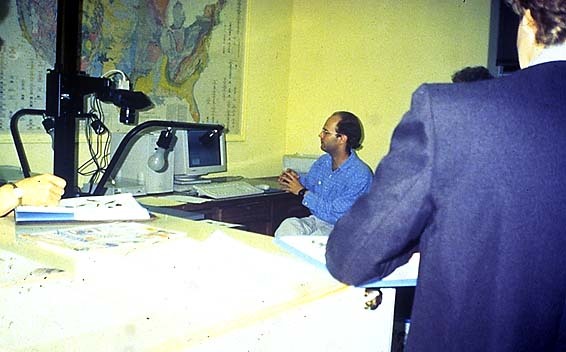 CAL, in collaboration with the Society of American Archivists (SAA), the Office of the Smithsonian Institution Archives (OSIA) and the Division of Vertebrate Paleobiology, NMNH, and with supporting materials and advice from the Library of Congress (LC) the National Archives and Records Administration (NARA) and the National Park Service (NPS), organized an "Angel Project." Fig. 5: The integrated approach for the preservation of this collection, as demonstrated at the SAA "Angel Project." The amount of handling of an object, as well as labor costs, can be reduced by processing, assessing condition, rehousing and reformatting at the same time. An integrated approach to the preservation of the collection was devised to reduce incidents of physical contact with the illustrations found within the collection (Fig. 5). The process began with the completion of a Preservation Priority Worksheet that was originally developed by the SAA in collaboration with the Research Libraries Group and the Commission on Preservation and Access in October, 1993 (Appendix I).14 This survey tool utilizes a numerical ranking system and easily-followed matrices to plot the overall value, exposure, and risk of a collection, allowing for unbiased comparison among many different types of collections. 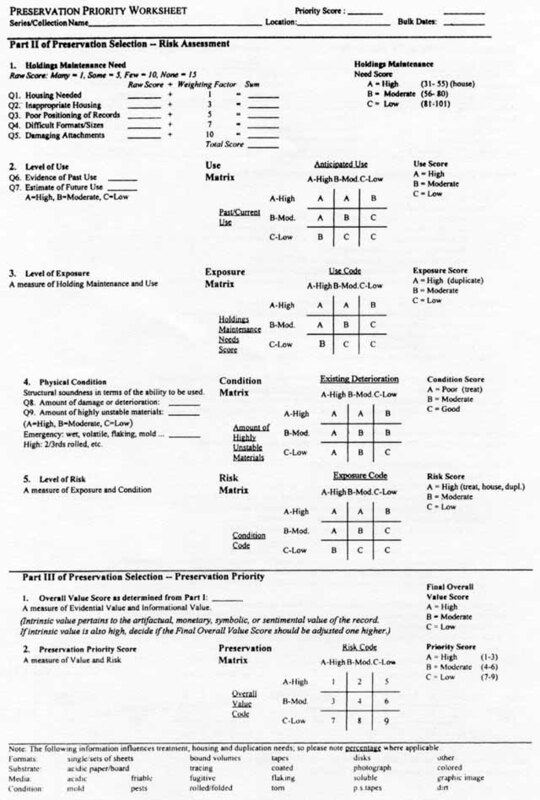 Since there were three additional collections of illustrations and other related materials besides the Marsh Collection housed in the Division of Vertebrate Paleobiology,15 this quick survey allowed the staff an opportunity to rank and compare the overall values, problems and needs of each of the collections. The data generated by the survey was then entered onto a Preservation Priority Data Base so that the general collection needs could be easily evaluated in order to determine which collection within the repository should be targeted for treatment, rehousing and/or reformatting. The Marsh Drawing Collection was chosen for the SAA pilot project based upon its number one priority ranking coupled with its great holding maintenance need, where the lower the number the greater the need (Figs. 6-7). Fig. 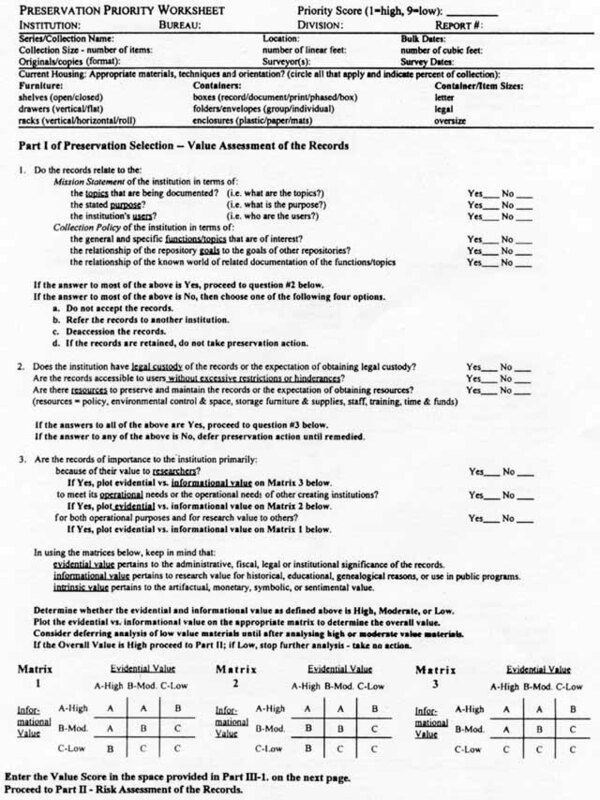 6a: The completed Preservation Priority Form (verso) for the Marsh Drawing Collection assigns a numerical value to the needs of the collection. Fig. 6b: The completed Preservation Priority Form (verso) for the Marsh Drawing Collection assigns a numerical value to the needs of the collection. Fig. 7: Transcribing numbers to a data base worksheet allows easy comparison with other collections within a repository. Once a preservation priority survey has identified a collection as a priority and targeted its general needs (such as the need to be rehoused), staff time and energy can be allocated to prepare for future preventive conservation initiatives. In the case of large collections, the next step might be a Random Sampling Survey16 of individual items within the collection to determine specific needs, such as types of housing. For instance, by surveying ten percent of the collection (noting size, condition, medium, etc.) using a randomly generated numerical system to designate specific objects within the collection, the housing needs of the collection can be quantified and necessary supplies determined and ordered. Done correctly, this technique allows a detailed and statistically accurate assessment of extremely large collections in a very short amount of time (for instance, a collection of 5,000 objects in one week by one surveyor). Proper housing and reformatting, two integral components in the preservation of a collection, are the next steps in this systematic approach. 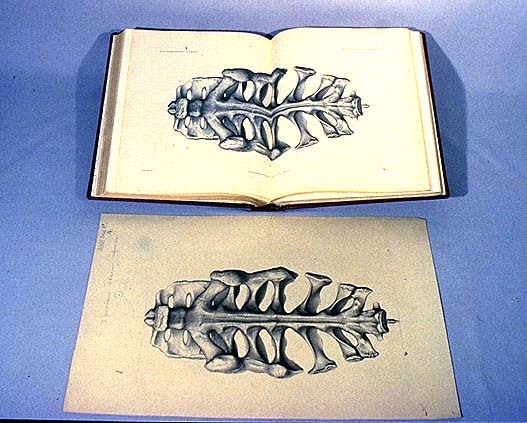 By providing a protective barrier between the illustrations and the environment (or researchers who may be studying at the collection), and by enabling access to the images without handling of the original illustration (which could remain in storage), these actions promote the continued care of the collection. Fig. 8: Andrew Robb, CAL Post-Graduate Intern in Photography Conservation, demonstrates a digital imaging program for the SAA "Angel Project." Once the collection has been processed, the document types identified, selections made for enclosures (such as mats, polyester sleeves and folders, containers, and furniture) and the collection reformatted (Fig. 9), the accessibility (and consequently the value) of the collection will logically increase. This fact--that easier access to a collection leads to its increased value as a holding--should have dictated in the beginning that the preservation of this collection, and others like it, should never have been considered inconsequential. Fig. 9: Steps, with options, for the processing, rehousing, and reformatting of a paper-based collection. The advent of the Internet, and the concurrent explosion in the demand for information, has the potential for increasing this problem of "publish, then perish." As more and more funds are diverted to digital imaging programs, additional funds must be slated to insure that original materials, and the chemical and physical information that can in no way be fully reproduced by even the most advanced reformatting techniques, are stabilized by proper care and storage, rather then allowed to degrade. Through the collaborative efforts of museum professionals, conservators, and a new breed of information managers, simple solutions, like the integrated approach outlined in this "Angel Project," can be advocated to preserve the original materials and the evidence inherent in them. The authors would like to give their thanks to Mike Brett-Serman and the staff of the Department of Paleobiology, NMNH, SI; Paul Theerman, Tammy Peters and the staff of OSIA, SI; Elaine Hodges; Andrew Robb, Holly Anderson and the staff and supervisors at the Conservation Analytical Laboratory, SI; the SAA "Angels;" and Alice Tangerini. Also, we would like to thank Lisa Mibach, for inspiring the "Angel Project," and Sarah Wagner and Karen Garlick, for information pertaining to the Preservation Priority Worksheet. 2. Author to whom correspondence should be addressed. 4. The idea of sponsoring an "Angel Project" has been used by other individuals. For example, Elizabeth Morse, Paper Conservator at the Harvard University Library, organized one to aid in the execution of a large survey. 10.The bulk of the collection can be found at Yale University, one of the institutions that funded the expeditions. 12. It is believed that when the term "wood-cut" was used here it actually refers to wood engraving. 15. These collections are currently labeled as the "Gilmore Archives" (14 envelopes housing approximately 470 drawings and photographs), the "Marsh Archives" (approximately 300 prints, grouped together with metal fasteners), and the "U.S. Geological Survey" (approximately 640 prints and drawings). damaging attachments--examples include rusting fasteners, rubber bands, oozing or brittle pressure sensitive tapes, heavy twine, acidic wrappers or mounts, improperly applied or inappropriate leader labels attached to magnetic tape, motion picture, or microfilm. High level of damage/deterioration means that the majority of the materials have significant structural damage so that they cannot he safely handled at all or to any useful degree in their current condition. The materials are in poor condition. Preservation attention is required for safe handling of the materials. Moderate level of damage/deterioration means that the majority of the materials have some structural damage, hut they can be safety handled in their current state. The materials are in moderate/fair condition. However safe handling may require extra precautions and care. Preservation attention is required, hut it can he postponed in the short term. Low level of damage/deterioration means that the majority of the materials are structurally sound and can he safely handled. The materials are in good condition. Preservation attention is not required or can he postponed for the long term. With magnetic media: a moderate amount of oxide shedding may exist primarily at the ends of the tape, or the plastic carrier may he cupped or warped, minor evaporation of tape lubricants such as that the tape can be relubricated sufficiently for one-time playback, the tape may he usable/readable. With magnetic media: the tape pack may he dusty or dirty, there may he minor oxide shedding, the tape is usable/readable. High Amounts of unstable materials mean that the majority of the materials (>2/3) are highly unstable, as defined above, even if the materials are currently in good condition. Moderate Amounts of unstable materials means that a moderate amount of the materials (1/3 to 2/3) are highly unstable, as defined above, even if the materials are currently in good condition. Low Amounts of Unstable Materials means that a low amount of the materials (<1/3) are highly unstable, as defined above, even if the materials are currently in good condition. B. If exposure score is high (holdings maintenance vs use), may want to reformat material for use by researchers. Paper delivered at the Book and Paper specialty group session, AIC 24th Annual Meeting, June 10-16, 1996, Norfolk Virginia.